During the spring of 2018, Friends of Guild Park has received numerous comments spring from park visitors about the state of the forest, woodlands and trees at Guild Park. Specifically, about the number of fallen trees throughout the site is a source of public concern. Friends of Guild Park recently asked Guild Park officials for an update about current forest conditions in the park and specific questions about what is being done. Below is a file with the information and responses received on May 17, 2018 from members of the City of Toronto’s urban forestry division. This is the group responsible for forest areas across the city, including those at Guild Park. For about two hours, Bob Kortright of the Toronto Field Naturalists showed examples of Guild Park's biodiversity - from butterflies to a butternut tree, mushrooms to mulberries, Cooper Hawks to cornflowers. The photos from today show participants listening Bob describe the life cycles of various types of vegetation and wildlife. On the bright and sunny autumn afternoon, he took folks along some little-used public trails atop the bluffs, into Guild Park's Carolinian Forest and through the formal gardens of the 36-hectare public park. Everyone gained a new appreciation for Guild Park's amazing environmental features people who came were greeted by a 4-point buck ambling along the park's Waterfront trail. When the deer turned around to return down the hill, he showed a wound on his haunch. Not sure if it was the result of an attack or a wound. The animal didn't appear limping so it's hoped the injury won't be serious. The rest of the tour was full of identifying fungi, trees and birds. Thanks the tour leader Bob Kortright of TFN for arranging the memorable tour and to the 2 dozen folks who braved the zero degree weather to enjoy Guild Park. Another follow-up to the Native Plant Give-Away that Friends of Guild Park hosted in August, was a Native Plant Workshop for everyone interested in learning about native plants and how to incorporate them into your garden. The event was free and hosted by Park People and Carolinian Canada. The workshop was led by native plant specialist, Ben Porchuk of Carolinian Canada. Ben has over two decades of experience in ecological systems recovery and is a strong advocate for restoring urban ecology to create greater resiliency. All workshop attendees were invited to stay for the North American Native Plant Society's Annual General Meeting. The AGM keynote speaker was Dr. Jon Johnson of First Story Toronto. First Story is a program at the Native Canadian Centre of Toronto devoted to researching and sharing Toronto’s Indigenous heritage through popular educational initiatives. As a part of this work, Jon leads tours about the Indigenous heritage in the GTA. Earlier this year, one of Jon's special tours with Park People included a visit to Guild Park. The City of Toronto's Arts Services division of Economic Development & Culture provides the latest details about the work now underway to re-open a unique arts facility, along with arts programming, at Guild Park. The website includes updates on the architect, Taylor Hazell Architects, selected to create the multi-use design for the building. This online resource also includes the history and describes many of the architectural features now on view at Guild Park's Monument Walk. 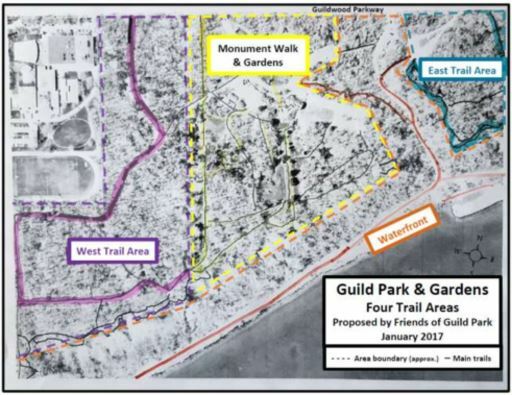 Funding for Guild Park Trail Master Plan approved, January 2017. However, the group is hoping to see E.B. Cox's sculpture collection relocated to the Rose Garden, which is just south of the Bandshell at Exhibition Place. John Mason highlights a link between the 1912 ceiling mural rediscovered at Queen's Park and Guild Park. "The newly-found paintings of 104 maple leaves above the Ontario Legislature was the work of Gustav Hahn, the older brother of Canadian sculptor Emanuel Hahn. Emanuel Hahn's two sculptural designs that once graced the Bank of Montreal's downtown Toronto headquarters are among the pieces of public art now at Guild Park. He designed the panels for the Arctic and Northwest Territories displayed near Guild Park's formal gardens. The younger Hahn also created the design for the Bluenose schooner on the Canadian dime and the caribou head on our quarter. Both Hahn brothers went on to teach at what was then the Ontario College of Art. It was there that Emanuel taught Elizabeth Wyn Wood, the sculpture student whom he married in 1926. Elizabeth Wyn Wood went on to become an exceptional sculptor, whose works are displayed at the Art Gallery of Ontario, the National Gallery in Ottawa, and also at Guild Park (the "provincial panels" depicting Manitoba and Saskatchewan)." The Toronto Star article by Robert Benzie about Gustav Hahn. The information and ideas are meant to start the discussion about the type of arts programs and arts facilities that are appropriate for Guild Park - its legacy as the Guild of All Arts and the environmental and physical constraints within its 88 acres. This report has already been provided to the City's officials involved with Guild Park. We thank everyone who's already provided input and look forward to more ideas and comments about returning the arts to Guild Park. Guild Park designated an official Guildwood Village Community Clean Up Area this year. Beautiful weather for a Spring Cleaning day at Guild Park. Thanks to the Guildwood Village Community Assn. (GVCA) for including Guild Park as part of the morning clean-up. Local MPP Mitzie Hunter was among the people who came out to support the cause. Dozens of bags of trash got picked up by volunteers, with City of Toronto crews making the rounds later to dispose of all the refuse. Many Guild Park visitors today got to see the two new park noticeboards now installed - one at the Livingston Road entrance (pictured); the other at the start of the park's new Monument Walk off of Guildwood Parkway. Nuit Blanche has had a positive effect on the City of Toronto and visitors who attended the spectacular event. The City of Toronto reported last fall that through an Ipsos Reid survey Nuit Blanche 2015 "generated an economic impact of about $41.5 million for Toronto...with an estimated attendance of over one million people, including 205,000 out-of-town visitors." As the planning for the Nuit Blanche 2016 is underway, I would like to take this opportunity to expand the experience into Scarborough for the 2017 season, specifically in the Guild Park and Gardens. The gardens would accommodate the event perfectly. Within its 88 acres stands a Greek amphitheater, several monuments and artifacts from great buildings across Ontario including a historical monument walk installed last year by our City Cultural division. The Guild Park and Gardens would be the perfect setting to expand the Nuit Blanch experience east of the City and is supported by the Guildwood Village Community Association. The site would be suitable for artistic installations and support visitors for the 2017 season to coincide with the revitalization for the Guild Park and Gardens and Guild Inn (Bickford Residence). The Nuit Blanche theme works well with the objectives of the Guild Park and Gardens which hosts, historical walks, an annual artist's festival, annual outdoor theatre performances. The revitalization will also bring art programs offered by the City of Toronto Cultural division. 1. City Council direct the General Manager, Economic Development and Culture to explore including Guild Park and Gardens as a venue for Nuit Blanche 2017. The City is looking for your input. What types of art programming would you like to see at Guild Park and Gardens? Are you interested in taking a course? Do you have an idea for the name of the new arts and culture facility? Share you opinions and suggestions with the City.